I love onion rings. This is probably expected, what with my onion love posted previously elsewhere on this site. What I don't love is frying things. There are a few exceptions, but for the most part if a recipe calls for frying, it doesn't usually get made. 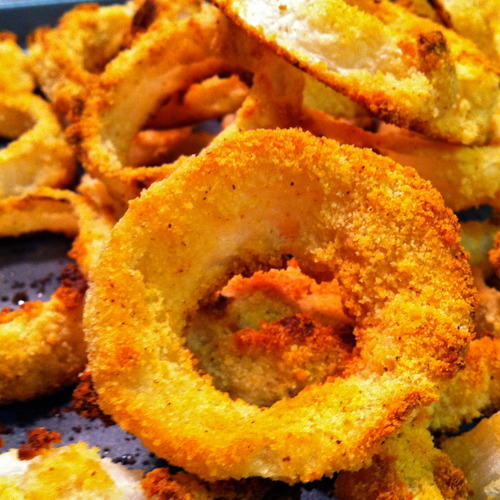 I've modified recipes, like chicken nuggets and french fries, so that I can bake them instead, but onion rings have always failed in this department, even with recipes intended for baking. They never had the same taste, the breading would fall off, it was a disaster. Thus I resigned myself to only getting onion rings on the rare occasion we could get them at a restaurant. Then one day, browsing for completely different books, I came across a cookbook from an author that I love already, Ellie Krieger. I took it home to see if I wanted to own this cookbook too, and lo and behold, a baked onion ring recipe! I was doubtful at first, what with my past failures on this front, but I resolved to try it anyway, and it worked! The breading was still somewhat difficult to work with, but nothing like the other times, and it stayed relatively attached to the onion. Next time, I'll spice up the recipe a bit with more cayenne, mainly because I'm not as fond of the buttermilk taste, and it's very present, though not overwhelming, in this recipe. Overall, a definite win. Preheat the oven to 450°F. Spray a baking sheet lightly with oil. Place the potato chips in the food processor and process into fine crumbs. Transfer to a shallow bowl and stir in cayenne. In another shallow bowl, combine buttermilk, 2 T flour, and the salt and pepper.